The Iron Crown of Lombardy (Italian: Corona Ferrea di Lombardia; Latin: Corona Ferrea Langobardiae) is both a reliquary and one of the oldest royal insignias of Christendom. It was made in the Early Middle Ages, consisting of a circlet of gold and jewels fitted around a central silver band, which tradition holds to be made of iron beaten out of a nail of the True Cross. The crown became one of the symbols of the Kingdom of the Lombards and later of the medieval Kingdom of Italy. It is kept in the Cathedral of Monza, outside Milan. The Iron Crown is so called because it was believed to contain a one centimetre-wide band of iron within it, said to be beaten out of a nail used at the crucifixion of Jesus. The outer circlet of the crown is made of six segments of beaten gold, partly enameled, joined together by hinges. It is set with twenty-two gemstones[note 1] that stand out in relief, in the form of crosses and flowers. Its small size and hinged construction have suggested to some that it was originally a large armlet or perhaps a votive crown. According to other opinions, however, the small size is due to a readjustment after the loss of two segments, as described in historical documents. According to tradition, St. Helena, mother of Constantine the Great, had the crown forged her son around a beaten nail from the True Cross, which she had discovered. Pope Gregory the Great passed this crown to Theodelinda, princess of the Lombards, as a diplomatic gift, although he made no mention of it among his recorded donations. Theodelinda donated the crown to the church at Monza in 628. According to another tradition reported by the historian Valeriana Maspero, the helm and the bit of Constantine were brought to Milan by Emperor Theodosius I, who resided there, and were exposed at his funeral, as described by St. Ambrose in his funeral oration De obituu Theosdosii. Then, as the bit remained in Milan (where it is currently preserved in the cathedral), the helm with the diadem was transferred to Constantinople, until Theoderic the Great, who had previously threatened Constantinople itself, claimed it as part of his right as the king of Italy. The Byzantines then sent him the diadem, holding the helmet (which was exposed in the cathedral of St. Sophia) until it was looted and lost following the sack of Constantinople in the Fourth Crusade in 1204). King Theoderic then adopted the diadem gemmis insignitum, quas pretiosior ferro innexa(s)crucis redemptoris divinae gemma connecteretas (St. Ambrose De obituu Theosdosii) as his crown. This is the Iron Crown, passed by the Goths to the Lombards when they invaded Italy. 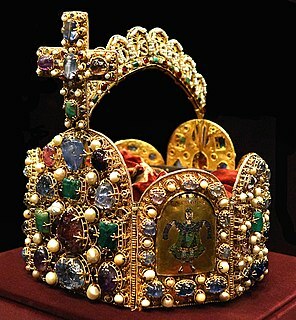 The crown was used in Charlemagne's coronation as King of the Lombards. Contemporary or nearly contemporary accounts of the initiations of the earlier kings of the Lombards stress the importance of the king's holding the holy lance[clarification needed]. The crown was certainly in use for the coronation of the kings of Italy by the 14th century, and presumably since at least the 11th. Old research dates the crown to the 8th or early 9th century[note 2] But according to a recent study, the crown in its current state is the result of two different works made between the 4–5th and the 9th century. This seems to validate the legends about the origin of the crown, that date it back to the Lombard era and the coronation of their kings. On May 26, 1805, Napoleon Bonaparte had himself crowned King of Italy at Milan, with suitable splendour and magnificence. Seated upon a throne, he was invested with the usual insignia of royalty by the Cardinal-Archbishop of Milan and, ascending the altar, he took the iron crown, placed it on his head, and exclaimed, being part of the ceremony used at the enthronement of the Lombard kings, "Dieu me la donne, gare à qui la touche" ('God gives it to me, beware whoever touches it'). On the occasion, Napoleon founded the Order of the Iron Crown, on June 15, 1805. 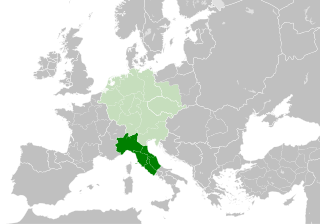 After Napoleon's fall and the annexation of Lombardy to Austria, the order was re-instituted by the Austrian Emperor Francis I, on January 1, 1816. The last to be crowned with the Iron Crown was Emperor Ferdinand I, in his role as King of Lombardy and Venetia. [note 4] This occurred in Milan, on September 6, 1838. After the Second Italian War of Independence, when the Austrians had to withdraw from Lombardy in 1859, the Iron Crown was moved to Vienna, where it remained until 1866, when it was given back to Italy after the Third Italian War of Independence. From the 9th to the 18th century, the Kings of Italy were also the Holy Roman Emperors, so many of them received the Iron Crown of Lombardy at Pavia, the official capital of the Kingdom. The earliest definitively documented use of the Iron Crown in a coronation was at that of Henry VII at Milan in 1311 or 1312, a ceremony with French and Roman influences that was the most elaborate example of the Milanese coronation rite. It was given to the King with the words "Accipe coronam regui" ('Receive this royal crown') and the prayer "Deus perpetuitatis" ('God of continuity'). This followed the King's receiving the sword of state and preceded the scepter, verge, and orb and cross. 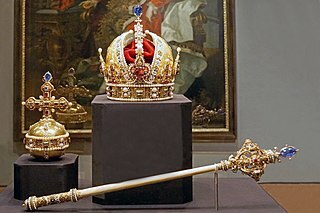 In 1993, the crown was subjected to extensive scientific analysis performed by the University of Milan using X-ray fluorescence (XRF) analysis and radiocarbon dating. The XRF analysis on the crown metal revealed that all the foils, rosettes and bezels were made with the same alloy, made of 84–85% gold, 5–7% silver, and 8–10% copper, suggesting a contemporary construction of the main part of the crown, while the fillets external to the enamel plates and the hinge pins were made of 90–91% gold and 9–10% silver, suggesting subsequent reworking. Three of the twenty-four vitreous enamel plates are visually different from the others in colour and construction, and were traditionally considered to be later restorations. The XRF analysis confirmed that they were made with a different technique, with their glass being made of potassium salt, while the others are made of sodium salt (sodium is not directly detectable by the XRF analysis). Radiocarbon dating of fragments of beeswax used to fix the enamel plates to the gold foils of the crown showed that the wax under the "strange" plates was from around 500 AD, while the ones under the "normal" plates came from around 800 AD. This is consistent with the tradition of a more antique crown, further decorated during the reign of Theoderic (with the addition of the enamels), and then extensively restored during the reign of Charlemagne. The "iron nail" was found to be 99% silver, meaning the crown contains no iron. However, a note from the Roman Ceremonial of 1159 provides that the Iron Crown is so called "quod laminam quondam habet in summitate", stating that the iron was once laid over the crown (probably as an arc, as in other crowns of the era), not into it. Speculations have been made that the silver circle was added by the goldsmith Antellotto Bracciforte, who restored the crown in 1345 to reinforce it given that the (presumed) theft of two plates had weakened the hinges. (Currently, in one of the crown's junctions, two of the plates are not joined by the hinge, which is too damaged, but are held only by the inner silver ring.) In 1352, for the first time, a document (the inventory of the treasury of the Cathedral of Monza) describes the crown as being small. In the Father Brown TV series, the crown figures in episode 70 (The Two Deaths of Hercule Flambeau). ^ In 1996, ANTARES (Australian National Tandem for Applied Research) tested the samples of the beeswax and clay mixture used to hold the gemstones of the Iron Crown in their settings and concluded that the Iron Crown was made between 700 and 780. ^ All other sources give the year of Henry VII's coronation as King of Italy as 1311; 1312 was the year of his coronation as Holy Roman Emperor. ^ On this occasion, the Iron Crown itself rested on four corbel S-shaped brackets rising from the rim of the actual circlet that surrounded the Emperor Ferdinand's head and the Iron Crown, in turn, supported four S-shaped half arches supporting a diminutive orb and cross at the top. ^ a b c "Corona Ferrea, Museo e Tesoro del Duomo di Monza" (in Italian). ^ Philipp Blom, To Have and to Hold: An Intimate History of Collectors and Collecting, 2002, p. 146f. ^ a b c d Twining, Lord Edward Francis, A History of the Crown Jewels of Europe, B.T. Batsford Ltd., London, England, 1960. ^ Valeriana Maspero, La corona ferrea. La storia del più antico e celebre simbolo del potere in Europa, Monza, Vittone Editore, 2003, pp. 24-29. ^ a b "Iron Crown of Lombardy". Encyclopædia Britannica. July 22, 2013. ^ Woolley, Reginard Maxwell (1915). "The Rite of Milan". Coronation Rites. Cambridge: University Press. pp. 116–117. ^ Milazzo, M.; Sardella, P. "Analisi XRF quantitativa nelle applicazioni archeometriche" (PDF). Fisica E (in Italian). Archived from the original (PDF) on 2017-10-16. Wikisource has the text of the 1905 New International Encyclopedia article Iron Crown. Theodelinda, queen of the Lombards, was the daughter of duke Garibald I of Bavaria. Relics that are claimed to be the Holy Nails with which Christ was crucified are objects of veneration among some Christians, particularly Roman Catholics and the Eastern Orthodox. In Christian symbolism and art they figure among the Instruments of the Passion or Arma Christi, the objects associated with Jesus' Passion. Like the other Instruments the Holy Nails have become an object of veneration among many Christians and have been pictured in paintings and supposedly recovered. Agilulf called the Thuringian, was a duke of Turin and king of the Lombards from 591 until his death. Aribert was the archbishop of Milan from 1018, a quarrelsome warrior-bishop in an age in which such figures were not uncommon. 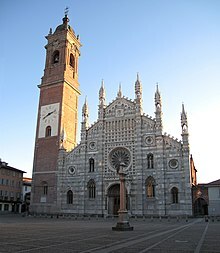 The Duomo of Monza often known in English as Monza Cathedral is the main religious building of Monza, in northern Italy. Unlike most duomos it is not in fact a cathedral, as Monza has always been part of the Diocese of Milan, but is in the charge of an archpriest who has the right to certain episcopal vestments including the mitre and the ring. The church is also known as the Basilica of San Giovanni Battista from its dedication to John the Baptist. The Kings of the Lombards or reges Langobardorum were the monarchs of the Lombard people from the early 6th century until the Lombardic identity became lost in the 9th and 10th centuries. After 568, the Lombard kings sometimes styled themselves Kings of Italy. After 774, they were not Lombards, but Franks. The Iron Crown of Lombardy was used for the coronation of the Lombard kings and the kings of Italy thereafter for centuries.